Microbial fuel contamination is organic debris generated by microscopic fungi, bacteria, and protozoa - commonly called "bugs". The microbes come from contaminated fuel supplies, through tank vents, and from seawater ballast. Microbial debris forms a slimy or stringy sludge, and mats of organic material can form at the fuel/water interface. The color of the material is generally black, brown or dark olive. It often has a foul or rotten egg odor. Agitation of the tanks - underway in rough weather, or the addition of fresh fuel - can resuspend the microbial debris into the overlaying fuel. 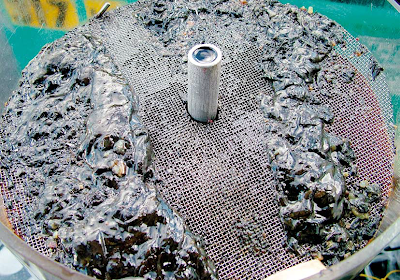 Microbial contamination suspended in the fuel can quickly clog filters. The best way to prevent microbial problems is to keep free water from accumulating at the tank bottoms. Biocides are another means of preventing microbial contamination. However, there are a number of problems associated with biocides. Biocides are commercially available additive packages that are toxic to microorganisms. The best biocides are soluble in fuel but can also partition into any free water that may be present in the tank. Biocides prevent microbial growth but will not reduce the amount of microbial particulates already formed in the fuel. The use of any fuel additive increases the chances of incompatibility between fuel stocks. When two incompatible fuel stocks are intermixed, they form filter clogging particulates. Incompatibility between distillate fuels is rare, and impossible to predict when it will occur, but this concern is why the some companies prohibit the use of any shipboard fuel additives. Many commercial suppliers use some kind of fuel additive in their storage facilities. Not all additives are compatible and the use of a shipboard additive package introduces a chance of additive incompatibility. Biocide effectiveness is problematic. Unless they are injected with a special metering device into the oncoming fuel stream, ensuring proper mixing and dosages is difficult. In undiluted form, all these additive packages are hazardous, requiring special usage, storage, and disposal precautions. The most effective biocides are, by their very nature, the most toxic. Since biocides migrate into the water layer, deballasting becomes an environmental concern. First, periodically test for free water using bottom soundings and water indicating paste. To the best of your ability, strip off any free water that is present. Second, rotate your fuel stocks. If the fuel is burned before the microbes have a chance to proliferate, a microbial problem can't develop. Leaving fuel just sitting in tanks is asking for problems. microbial problems. Despite manufacturers' claims, there does not appear to be much objective evidence that these devices work. Magnetic fuel treatment devices are therefore not approved by USCG on vessels.